But I have waited for approximately 30-40 minutes already. Is this normal? It seems it is stuck for me, I might be wrong, though. If you get an error when running the JasperReports Server installer on any platform, look at the log file created by the installer. This log records the status and completion of installer operations. If a specific error occurred, you may find an explicit error message. Even without an explicit error message, the log file should help you locate the cause of the error. If you've tried multiple installs, make sure you view the most recent install log. 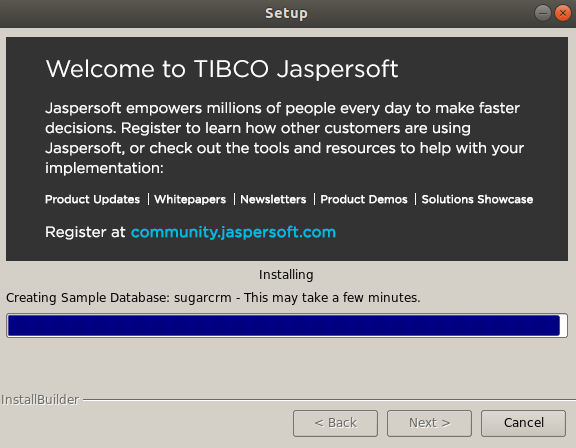 Then you can submit the installation.log to Jaspersoft Technical Support.